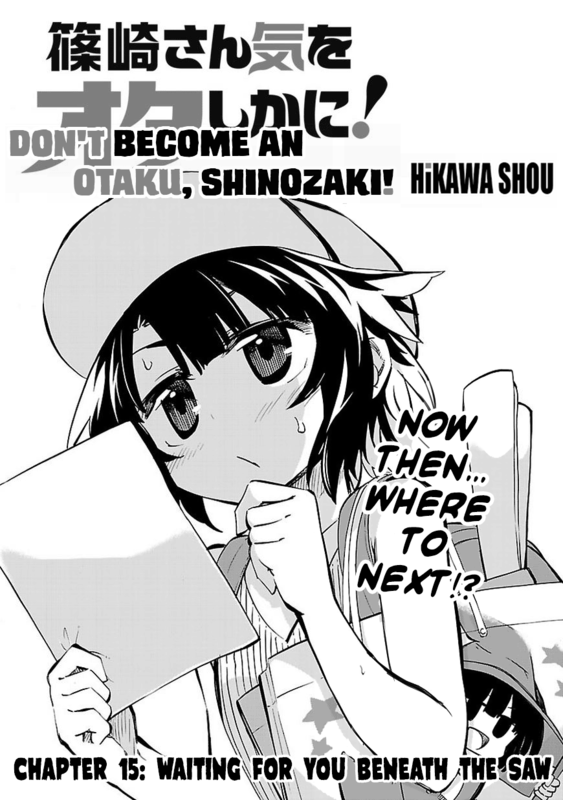 Shinozaki-san Chapter 15 – Release and Notes! Don’t worry, we’re not dead yet! Here’s a new chapter of Shinozaki! Saku Saku Tei – The author of this manga also draws doujinshi under the circle name Saku Saku Tei. If you look carefully you can actually see that name appear on one of the posters in the background while at the convention. Yuri Boys – On the same page where Akina first sees the doujinshi about how to conquer otaku girls, the doujinshi sitting right next to it on the same table is titled: “How to Conquer Yuri Boys”. It was left untranslated due to the size and shape of the title making it hard to fit English text in the same place as the kanji. Touhou Ref #1 – The crossdressing cosplayer in the line for the bathroom is dressed as Reimu from Touhou Project. This is the first of many references to Touhou this chapter. Bag Man – The cosplayer with the paper bag on his head is dressed as a parody of Faust from the Guilty Gear X game series. The outfit is nearly identical, except that Faust wears a tie instead of a bowtie, and uses a giant scaple and not a giant xacto blade. Of the other cosplayers on that same page, one of them has a very bad Gundam costume, but I do not actually know what that bunny thing is supposed to be. Cube Head – The dragon cube cosplayers are of course a parody of Dragon Ball. Yes, there actually are people who literally cosplay as the dragon balls themselves. It actually took me a while to figure out this reference because I thought they were some kind of dice, and only when I saw actual real cosplay pictures of people dressed as dragon balls did I realize what this was. Touhou Ref #2,3,4,5 – Touhou Project, in the Shinozaki-verse, is called “Hong Kong Project”, a reference to Team Shanghai Alice, the developers of Touhou. Hibari is cosplaying as a parody of Remilia, while Ayu is a parody of Sakuya. Other characters they’ve named include parodies of Hong Meiling and Alice. Giant Saw – As previously mentioned in the last TL notes, there are several public art pieces located near the Tokyo Big Sight. One of them is a giant sculpture of a saw, located basically right behind the convention center. It is rather famous local landmark and frequently used as a gathering point. It sounds like you don’t intend to get to translating the 4koma extra, then? I don’t mean to sound ungrateful to anyone; I actually just received my physical volumes just now and the 4koma look adorable, but I can’t read them. Still waiting on the first ones from volume one so we can do it in order. In the meantime though, I still want to encourage people to actually go and buy the volumes! Thanks for the chapter! Looks like Hikawa-sensei is pretty genuine about this Green x Orange thing. Suits me just fine since I’m a Yayoi x Reika shipper myself ;). I was also pretty thrilled to see all of those Touhou references (including a Mokou in that same bathroom line), since it was the author’s work as Saku Saku Tei which lead to me discovering this series. Haha, even if she’s still denying it, by this point Akina has gotten in so deep that I wonder if she’ll put those “How to conquer otaku girls” tips to use. I couldn’t find the Saku Saku Tei poster-! But yes, it was really quite hilarious to see all the parody work, down to “Remiya’s” hand movements and responses. A lot of in-gags, here, and am enjoying the series greatly! Thanks a bunch for the translations!! Glad to see you guys aren’t dead! Looking forward to the 4koma translations, I’ve got the physical volumes and they look p funny.